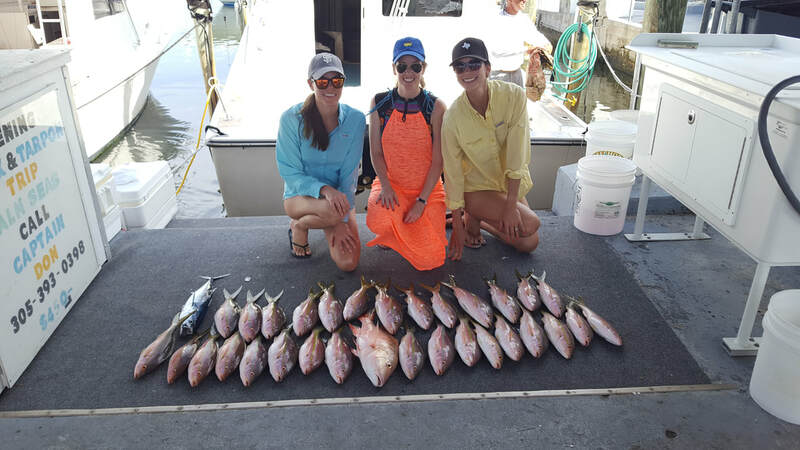 Fun 1/2 day with Marylyn her husband and their two girls as they caught yellowtails, kings and mutton snapper. Sophia and Molly did a great job of learning the yellowtail technique and we look forward to seeing them again next year. Two more great kids, 12 year old Ben and his younger sister Rilley were are anglers today and I must say they were very impressive. They listened well, learned quickly and didn’t give up when presented with a hard fighting fish. 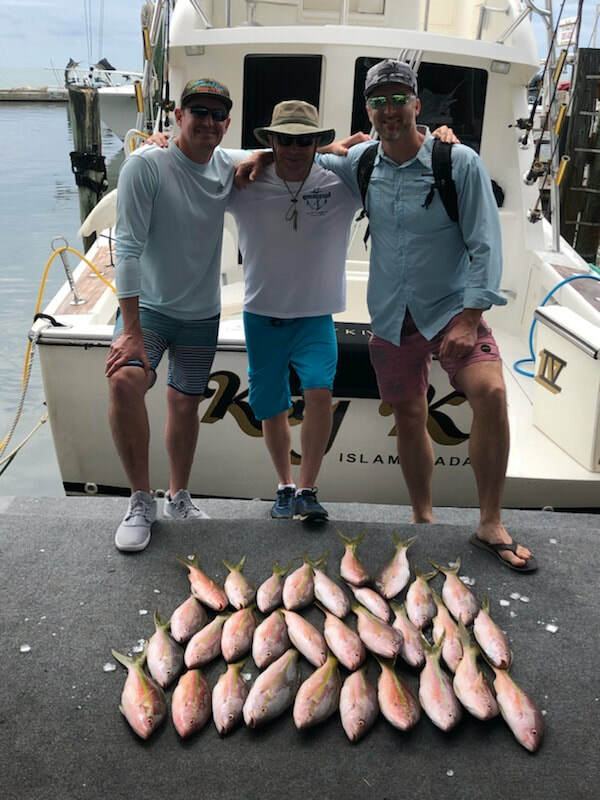 We caught our limit of snapper, catching a few silk and vermillion snapper to go with or yellowtail and three amberjacks toward the end of the trip so they could fight a big fish. Lisa and John are going to pack the fish tomorrow for their journey back to North Carolina and that big fish fry. 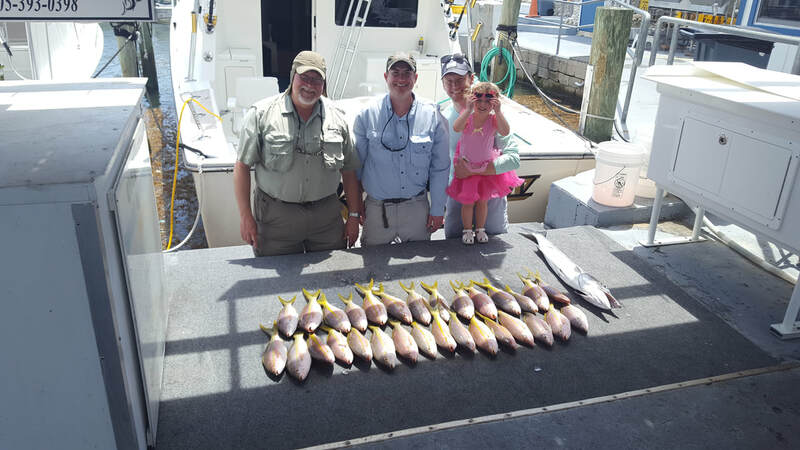 Quite the crew we had today, Dan brought his son and friends to fish with us on a beautiful Easter day. 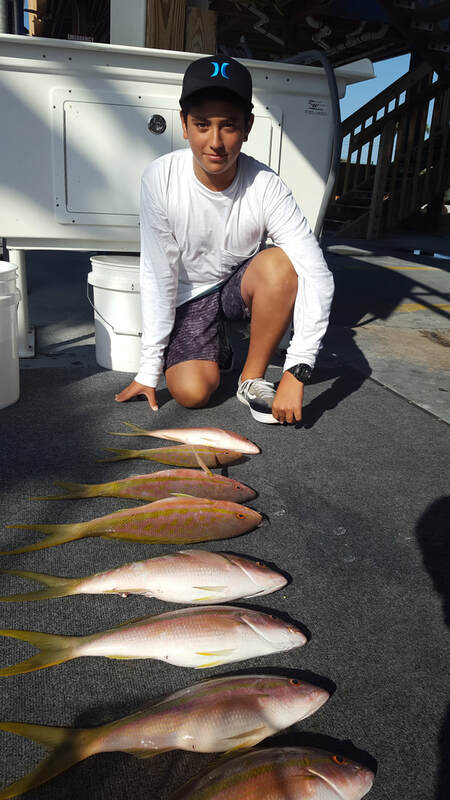 We caught plenty of yellowtail and we let the boys tug on a few AJ after the tails. As you can see we did have a small shark problem to start but they seemed to be satisfied with eating half a AJ and we got whole fish after that. 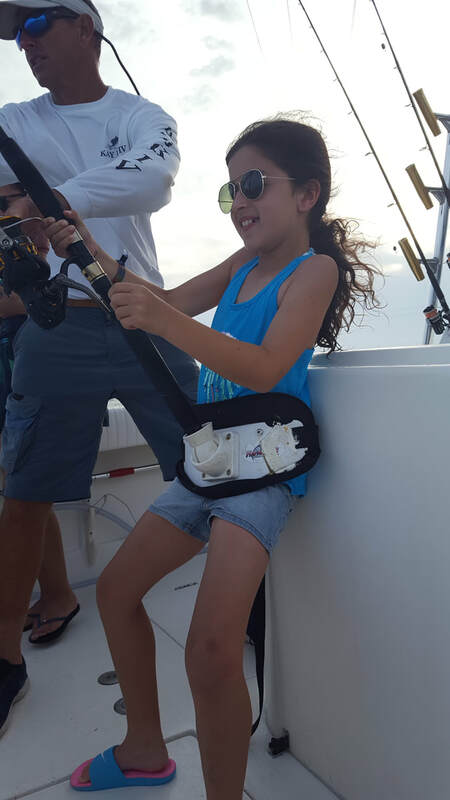 Olivia is one tough little girl, she battled one shark after another and never gave up till they were next to the boat. Julianne (her brother) was as tough and got to catch the one tarpon we hooked up. Great kids and parents, really fun evening in Whale Harbor channel! With the wind out of the south and predicted to be 20 knots i really tried to discourage my clients with their youngsters from going today but they were convinced it would be OK. W e were back by 9:00 after catching enough for dinner. It's usually better to listen to the Captain and his experience in these situations. Had CP and his girls out on a fairly rough day and we did do ok with the tails. 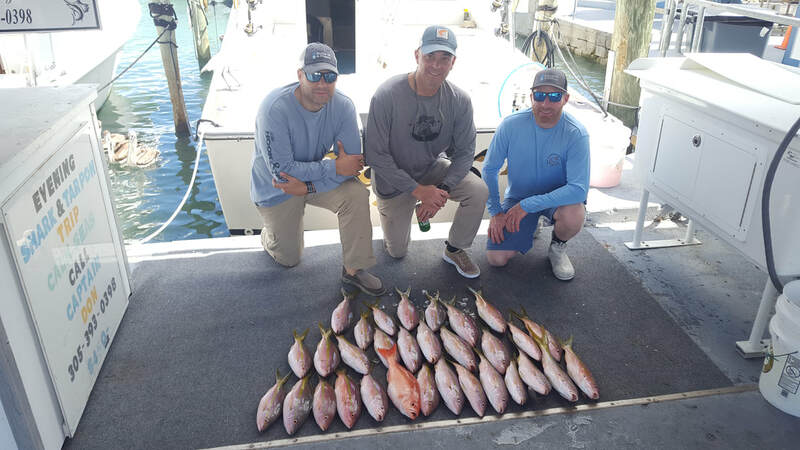 From what I heard on the VHF, the snapper bite was difficult (no current and really clear water) but we were fortunate and caught 25 or so. 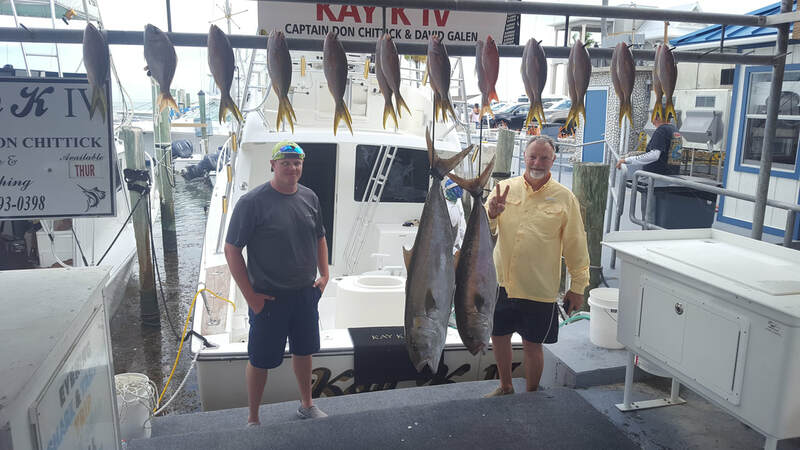 We also made Kelly Kalis happy with a blackfin tuna and we cauaght one almacco jack. Always a pleasure CP! Mike and the guys from GAF did a great job of learning the yellowtail fishing technique, (not always easy for some) and by the time we had caught a couple dozen tails they were catching one on every drift. The AJ's were also biting and five of the guys caught them, with two of them going over 50 lbs. The sailfish bite slowed down from yesterday although we did spend a hour looking for one at the end of the day. Everyone is watching as Kara works a big shark up to the boat. 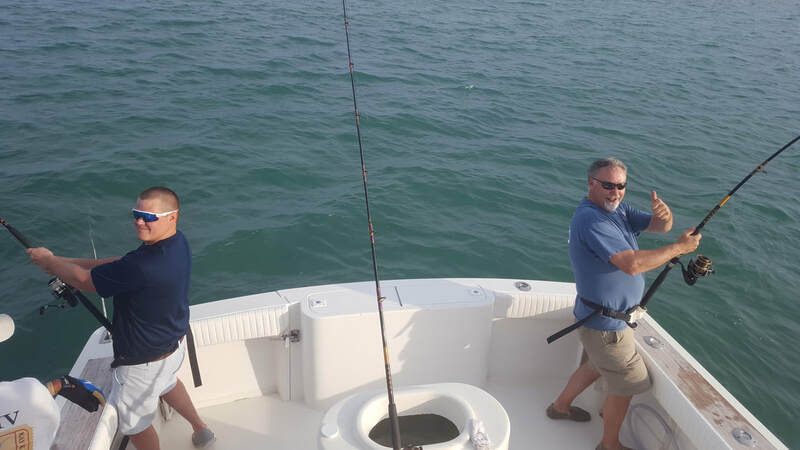 We caught a dozen sharks and jumped off one tarpon on our evening out yesterday. Trent gave it his best but had to hand the rod off to his dad to finish this 50 lb amberjack. 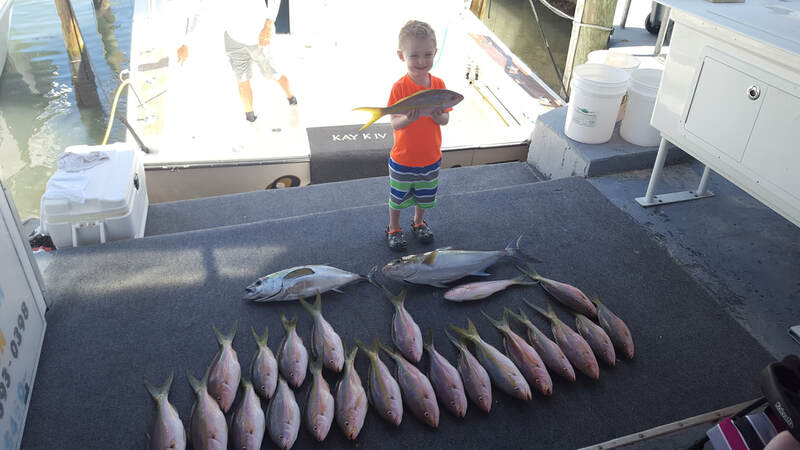 Trent had no such problems with the yellowtails and caught more than his dad as we limited out on them. 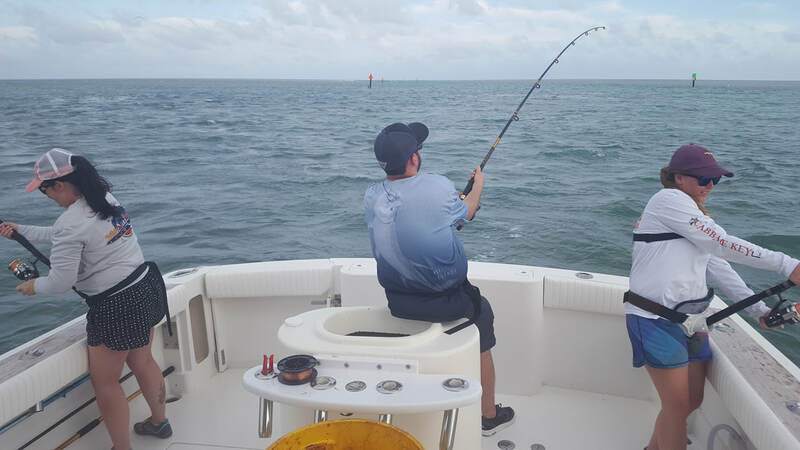 The sailfish bite quieted down today although we did gave it an hour or so at the end of the day in hopes of raising one. We had 6 people on board today but I couldn't find anyone when it came time for a picture! As soon as we hit the dock they all disappeared upstairs to the bar so I figured all that catching must have made them really thirsty. Today the yellowtail bite was not quit as good, it took us an extra half hour to catch our limit. Guess we should not complain after staring at these fish for two months and not getting more then a few to bite, it has been an unbelievable fishery for the last month. 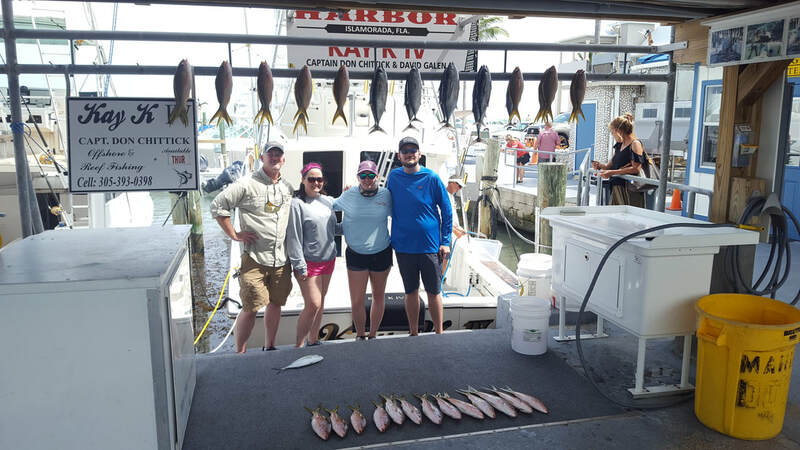 Heather, Hannah, Dalton and Mike struggled both with technique and the seas but and we finally caught what we needed and finished up sailfishing on a shortened day. 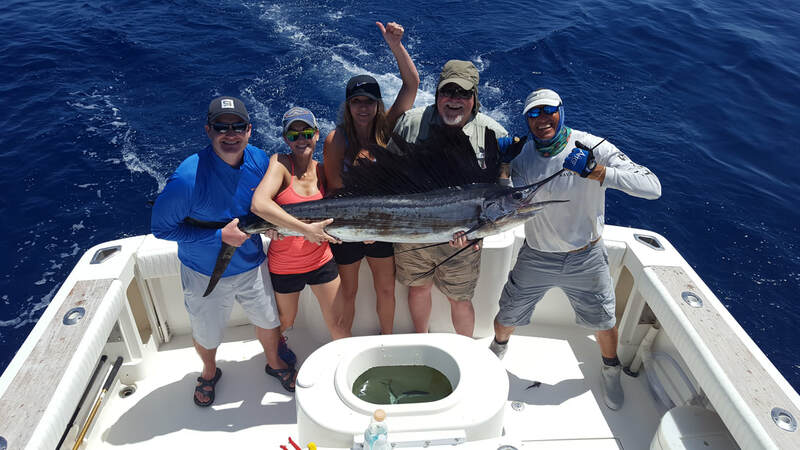 Lisa and Cary showed up the guys today as both of the caught sailfish. It was just a perfect day from the weather to the fishing. 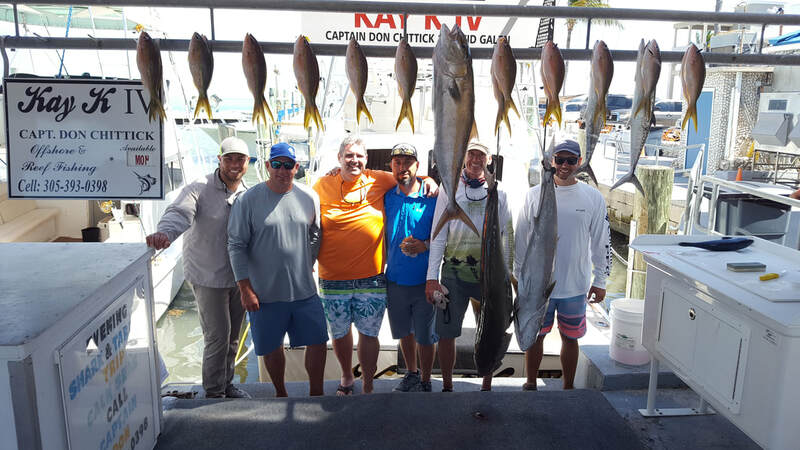 We started with the yellowtails, did a little deep dropping and ended the day catching the two sails. 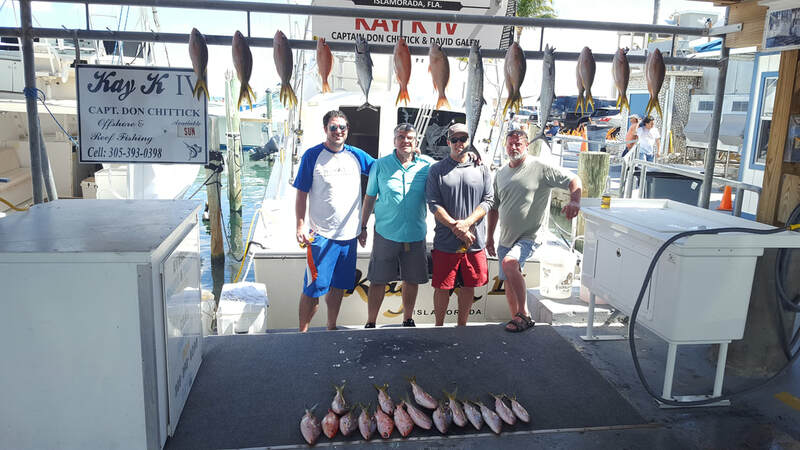 Pretty much everything we tried worked and we ended up catching over 50 fish, including vermillon snapper, yelloweye snapper, rose porgies and groupers. Thanks Steve. see you next year. The husband watched the kids and the ladies got to have an afternoon on the water. 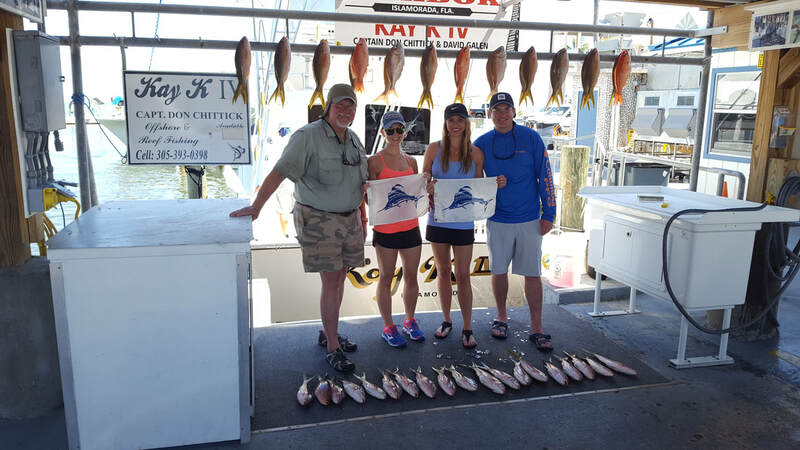 Janelle,Whitney and Marteen caught their limits of snapper also along with a decent mutton and a bonita. A good time was had by all and the ladies got a little time away. 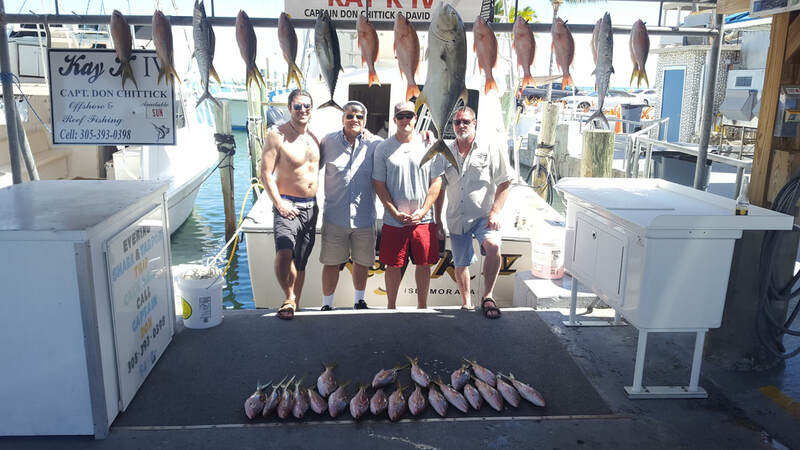 Shawn, Stewart and Ross left their wives at home with their young sons while they went fishing this morning. 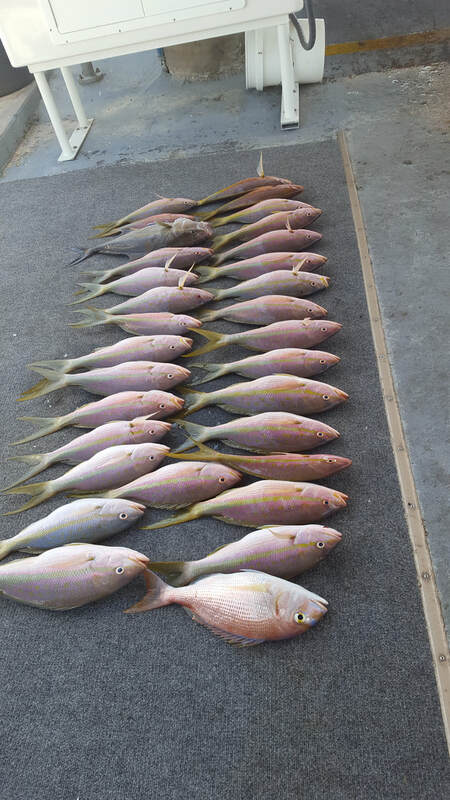 The yellows bit well again and we trolled for wahoos after catching our limit of snapper. On the way back I suggested the ladies might want to go in the afternoon and the said they would ask. A south wind at 15 knots made things a little uncomfortable this morning while catching yellowtails but the currant was with the wind and once again the bite was on. I must say I have never seen a yellowtail bite of big fish like these go on for as long as it has but I'm glad it"s happening. I was able to put Dan and James together on a shared charter after James's fiance decided it was going to be too rough for her today. We also caught a legal mutton and Dan caught a 20 lb gag grouper as the whistle fish. The forecasters said it was going to be 12 to 15 knots today, it was more like 18 or 19. I gave Steve the option of not going or doing a short day and they opt to give it a try which worked out for Steve and Jacob but not so well for mike. Around noon they decided to make it a 3/4 and after missing 15 good bites in a row I was ready to head for home too. 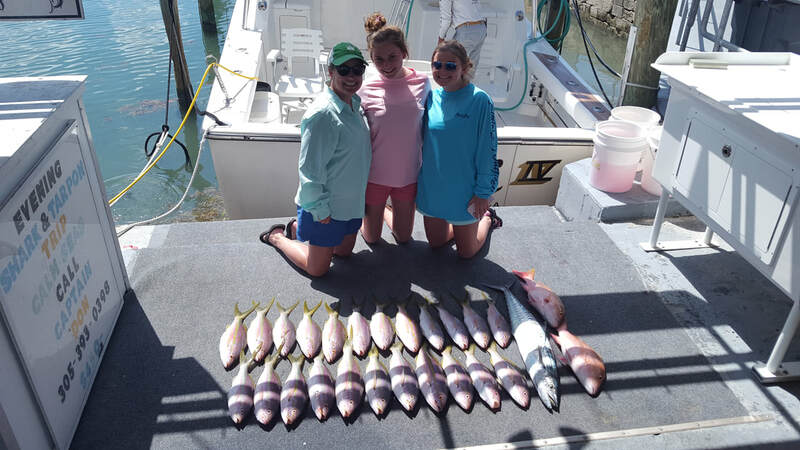 I bet Alley (in the pink dress) wouldn't have missed those fish!! See you guys (and girls) again Thursday. Sonja, and her group decided to do an evening trip after fishing with us a couple days ago. 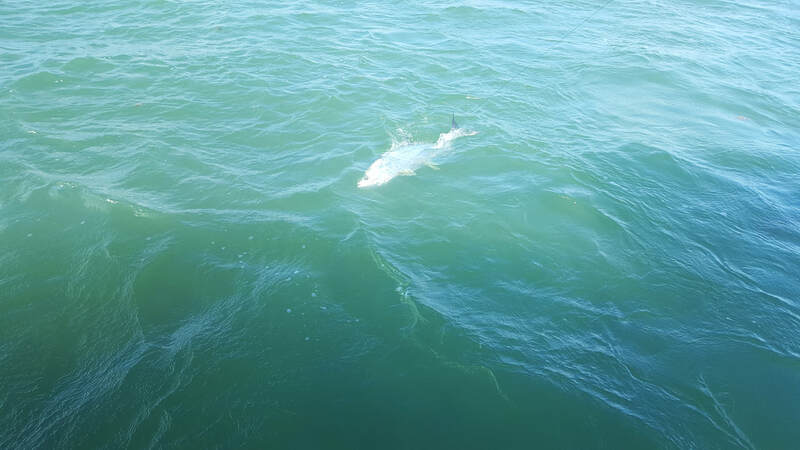 We were catching sharks when this 60 lb tarpon ate and we were able to get both the sharks and the tarpon to the boat. A very busy night with a mixed bag of sizes on the sharks, some in the 40 lb range all the way up to 130 pounds. Nice job on the tarpon AJ!! Phil and Cary told me when they got on the boat they had to be back by 12 and we were. 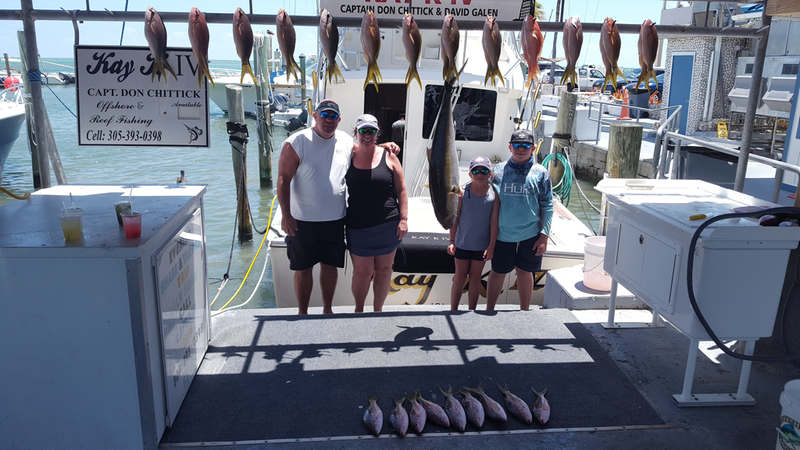 We left late because they had flown in from the west coast and wanted a little extra sleep so it was a litte difficult finding a spot for the yellowtails but we did and caught close to are limit before spending an hour sailfishing and then heading back. Couldn't get them to pose for pictures (their wives were calling) and snapper is on our menu tomorrow night. 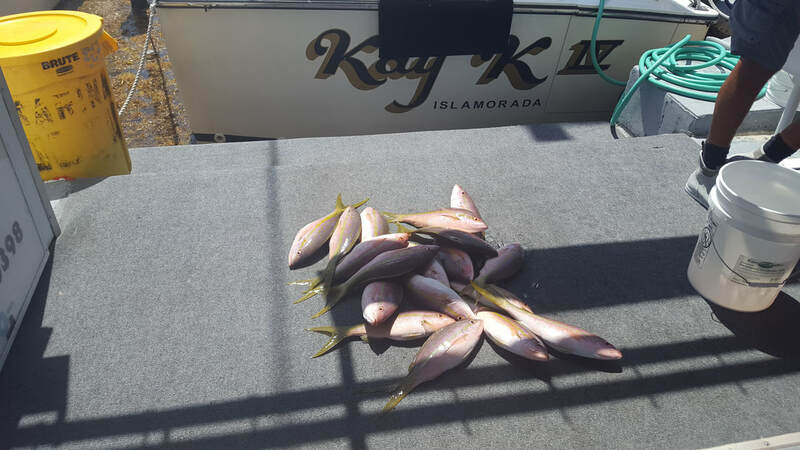 Traditionally spring is a great time to catch amberjacks but up until today we have not seen many on the dock Today was AJ day with at least 8 caught that I saw, along with the yellowtails, kings and even a few mahi. 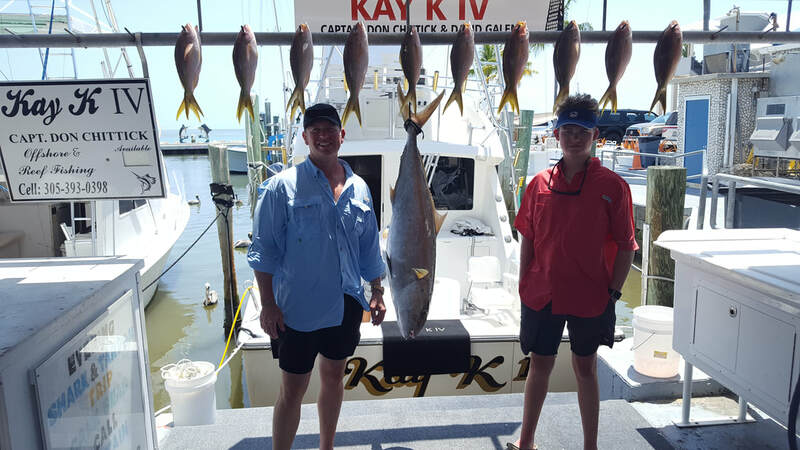 Clayton and Daniel got to catch an amberjack each and are taking all the fillets back to South Carolina for a really big fish fry. I got a big thumbs up from Clayton and a smile from Daniel as they fight their sharks this evening. It was pretty much nonstop all evening with shark after shark. Tomorrow we have them on board again for a full day out in the blue water. After a few days off we are back at it again and we had Sonja and her group out to start the day. One of the fish Sonja wanted to catch was a tuna. so we headed to the hump to catch tuna. 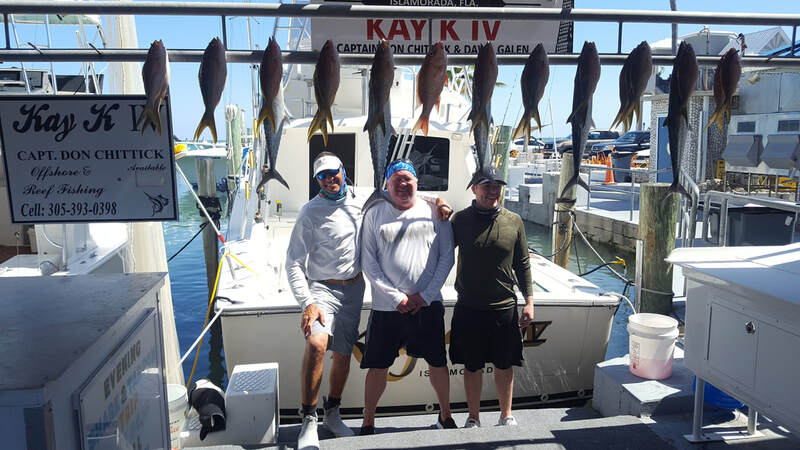 The tunas were biting fairly well and after we had sufficient numbers of them we spent a little time looking for mahi and then headed back in to finish up with the yellowtails. 30 fish later we headed home to get ready for our evening trip. 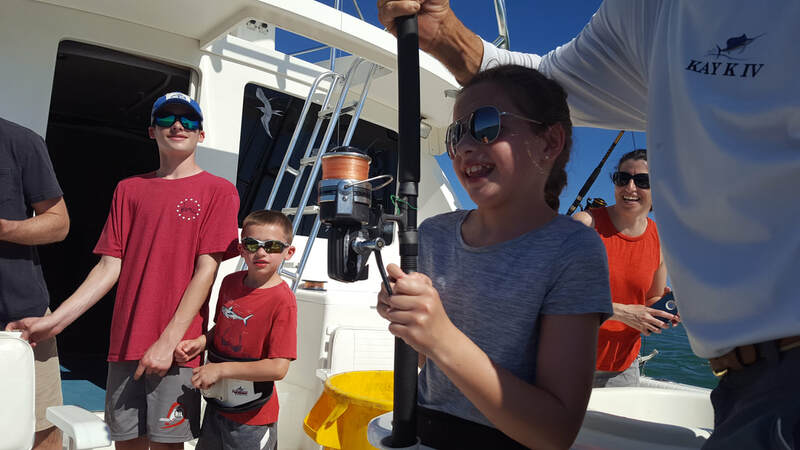 We started with the yellowtails and caught what we needed there then went deep to see what was happening out in the deep blue. 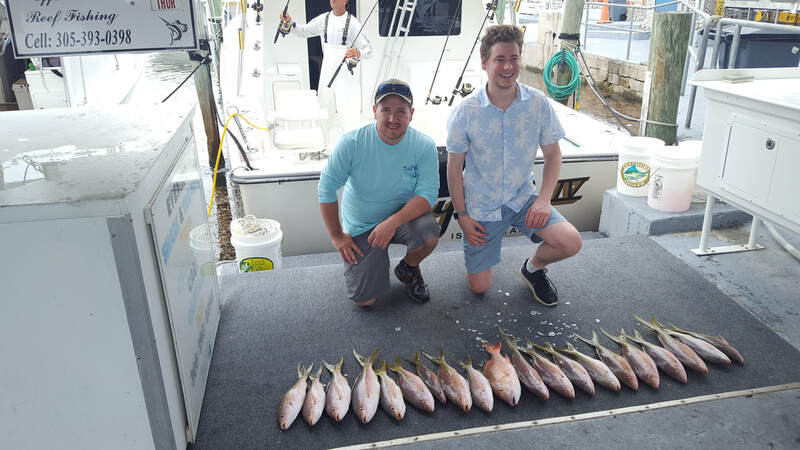 Caught a few verms and yelloweyes but it was as productive as I had hoped and we ended up back on the reef where we caught muttons and kings before heading home. 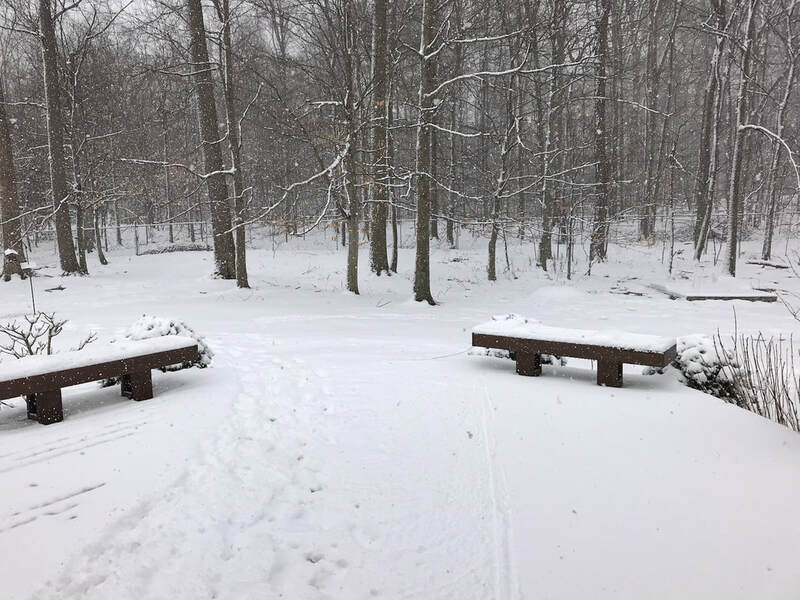 Marty sent me a picture of the snow in Ohio they went home to on Sunday, I don't miss that!. 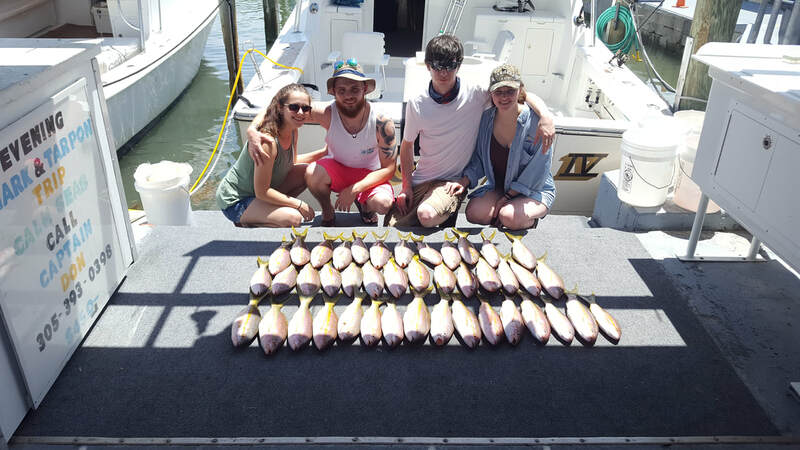 Yesterday we couldn't catch a legal mutton, today we caught 5. Tom, Tom, Marty and Eric are here on a return trip from Ohio and we kept them busy once again. We limited out on our snapper. caught a blackfin tuna, a couple kingfish and a 35 lb jack crevalle as the last fish of the day. Awesome way to finish up. Same group tomorrow so probably try a some deep stuff if the wind cooperates. Brian, Ray and Mike drove all night to get here in time for the trip today. I had warned Mike that it was going to be very windy but he said they were coming anyway and it turn out he made the right choice. The current was with the wind and the yellowwtails bit well and the wind really didn't start blowing hard till after noon when it got really sloppy. Caught 9 or ten muttons after catching the tails but not one was legal and only one vermillon from the 5 or 6 spots we stopped on. No kings today but they tell us the wind will be down tomorrow, so we are looking forward to that. We caught our limit of tails again today, 5 kings, a mutton and then went trolling for a wahoo. Got the bite after about 30 minutes or so and he was dumping a 50 wide but then something went wrong and we lost the fish and the lure. Very disappointing for Dave and I but Richard and Simon were not at all bothered, they were just impressed by that screaming bite and they said their arms were tired anyway from all the other fish we caught. We'll just have to catch him tomorrow!